We specialize in mica and mica products. We have started our mica business since 2001, initially imported mica raw materials from India. 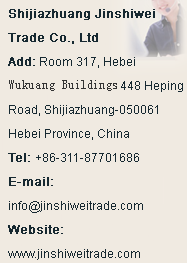 Jinshiwei Trade incorporated in 2005; import and export of mica, mica products and mica based pearlescent pigment. Jinshiwei is to be recognised and respected as a reliable and trusted provider of mica raw materials and mica-based products. Mica belongs to phyllosilicate minerals. Phlogopite and Muscovite are the main two different types of mica which most commonly used in various industries. Pearlescent pigments are special effect pigment based on mica substrate coated with Titanium Dioxide and /or Iron Oxide to creat pearl effects, interference colors. Our mica is widely used in cosmetics, plastics, paints, rubber and ceramics. We thank you for your interests in our company and our products and welcome you to try to use our mica to improve your products competitive strength. We can offer our existing and potential customer unparalleled customer service. Copyright 2012 -2013 JinShiwei .All Right reserved.